At best, it’s irritating to get an email that contains unreadable characters. At worst, it can prevent you from reading the mail at all. Sometimes, changing the encoding in Outlook shows those missing characters and lets you read the message. Here’s how to do it. If you’re not sure what “character encoding” is, we’ve got a comprehensive explanation for you. The less-comprehensive explanation is that a character is a glyph that appears on screen when you type something. So every letter in this article is a glyph that represents a letter—a, b, c, and so on. Behind the scenes, your computer represents these glyphs using a code that is interpreted by a program—like a web browser or a word processor—and then renders them on screen as a character. 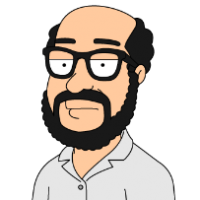 RELATED: What Are Character Encodings Like ANSI and Unicode, and How Do They Differ? So far, so simple, especially if you think there are only 26 characters in the alphabet, ten numbers, and some grammatical marks like ! or @. However, there are also 26 upper case letters and far more grammatical marks that you might realize (your keyboard only shows a small subset of possible grammatical marks, even for English). And this only covers one language, English, which is in one alphabet, Latin (also known as the Roman alphabet). The Latin alphabet includes most Western European languages and has a large number of diacritic symbols which aren’t used in English. Diacritic symbols are things like accents, umlauts, cedillas, and other marks that change the pronunciation of a letter or word. Then there are the many other alphabets, such as Cyrillic (most widely known for containing the Russian language), Greek, Kanji (Japanese), and Chinese, many of which include more than one language. Now, you can now start to see the scale of characters that need to be encoded as glyphs. There are over 70,000 Chinese glyphs alone. A character encoding contains a number of code points, each of which can encode one character. ASCII, which you have probably heard of, was an early Latin alphabet encoding that had 128 code points, nothing near enough to cover all the possible characters people use. W3’s recommended encoding for HTML is called UTF-8, which has 1,112,064 code points. This is enough to cover pretty much all of the characters in all of the languages in all of the alphabets (although not every single one), and is used in 93% of all websites. UTF-8 is also the encoding recommended by the Internet Mail Consortium. Why Would I Bother Changing It? Outlook, along with every other modern email client, encodes and decodes UTF-8. But if Outlook supports UTF-8, and UTF-8 is the recommended encoding, why would you see an unreadable character? This could happen for several reasons, but the primary ones are that you’re viewing the mail in plain text (either because you explicitly wanted to do that or a virus scanner had converted it to plain text before it got to you) or the encoding you’re using is set to something other than UTF-8. 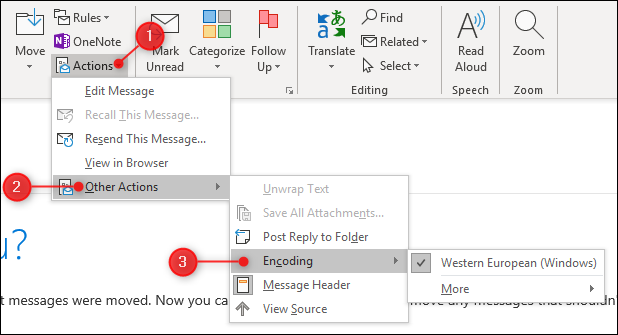 The encoding of an incoming mail is determined by the sender, so if they use ASCII, for example, Outlook will render the mail using the ASCII encoding. If your Word settings are set to replace “straight quotes” with “smart quotes” (the ones that point at an angle to show whether they are opening or closing quotes) then you’ll see “unreadable” characters in the mail instead of smart quotes, because ASCII doesn’t contain the appropriate characters for smart quotes. So, changing the encoding on a message might let you view those garbled characters they way they’re supposed to be shown. Okay, How Do I Change It? Luckily, changing the encoding of a message is quite easy in Outlook. Double click the message to open it up. On the Home tab of the message’s window, click Actions > Other Actions > Encoding to see what encoding is in use. This is an email from Microsoft about Clutter moving things from my Inbox. As you can see, Microsoft uses Western European to encode their mails. To change it, click “More” and then choose the encoding you want, such as UTF-8. That’s all there is to it—you should now be able to read the email. If you want to know how your outgoing emails are encoded, go to File > Options > Advanced and scroll down to the International Options. You’re looking for the “Preferred encoding for outgoing messages” option. The default is Western European, and the keen-eyed amongst you might wonder why this is, when, as mentioned above, the recommendation for email formats is UTF-8. The answer is that Western European is a subset of UTF-8, and as such can be read using UTF-8. 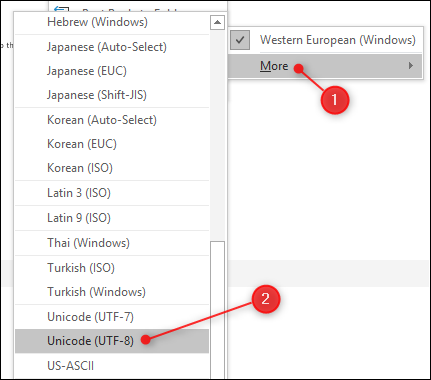 If you buy a copy of Outlook designed for Greece, for example, the default encoding will be Windows-1253, which is also a subset of UTF-8. You can change the default outgoing encoding to anything you want. If you want people to be able to read your messages, you’re best off keeping it as Western European or changing to a globally used encoding like UTF-8.